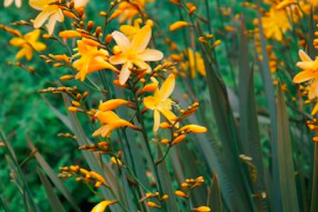 The market is full of Crocosmia selections but we think this one is a classic. The foliage is a dramatic bronze color and the spikey leaves are a great backdrop to the apricot yellow flowers that occur in July to September. To 2.5′ tall and forming an expanding clump. Full sun to part shade in rich, moisture retentive soil with light but consistent summer water. It makes a very good cut flower that lasts in a vase. Combine with other sun loving late summer blooming perennials. Completely deciduous in winter. Moderate deer resistance. 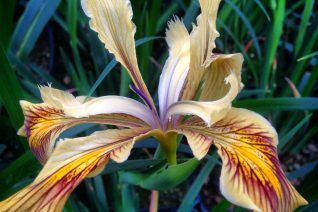 Wonderful Iris relative from South America that we cherish for its daily large three petalled intricately marked blue flowers. Rising to 2′ tall, corrugated blue green leaves accompany the strong upright stem. Beginning in May a daily procession of flowers that open at sunrise and close and finish by 2 to 3 in the afternoon. Don’t remove the spent flower as curiously more (and more) flowers will appear from the same stem. Large seed pods will form. These may be snipped off to refocus on more blooming. Full sun and rich, well drained soil in a warm position with regular summer water. I add a handful of all organic fertilizer around the base just before blooming. This markedly increases vigor and even the size of the flowers. Freezes back almost to the ground below 20ºF. Moderate deer resistance. Adorable little bulb that forms grassy colonies. Beginning in early summer and continuing to fall 10″ stems support amber orange intricate three petalled flowers. 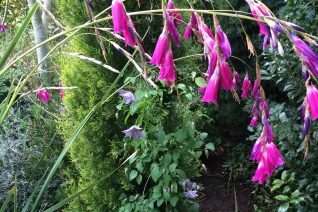 Each lasts just one day but new flowers appear seemingly from nowhere from the stems so do not remove. Grassy medium green corrugated leaves accompany the flowers. Open sites with little competition from other plants. Sharp drainage in average to rich soil with regular summer irrigation. Full sun to light shade. Surprisingly cold hardy. Rock gardens, containers. 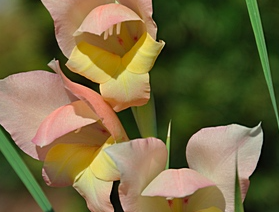 Hardy happy and elegant perennial gladiolus that is perhaps just a species but market…y’know. 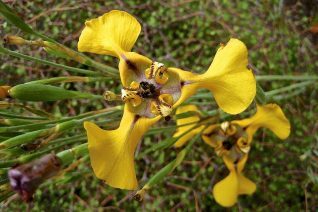 To 3′ tall it opens soft peach and yellow wild looking flowers up a sturdy scape. Multiplies quickly in rich well drained soil and a patch will form yielding multiple blooms and a great source of cut flowers. 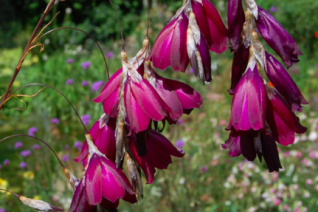 Nothing like hybrid garden gladiolus instead decidedly more wild looking and we LOVE that. Very easy to grow, tough and hardy. Emerges late often not until April be patient. Regular summer water and full sun will prevent the towers from falling over. If they do simply cut them and bring them in the house. Moderate deer resistance. GLADZILLA! Thats what we call this rambunctious, prolific and all too easy species Glad. Blue/gray foliage gives way to serpentine spikes lined with curiously colored cup shaped flowers. The exterior of the petals is best described as dove gray. The interior is more complicated with zones of yellow, purple, and brown. Lovely cut flower.. The scape rarely stands straight up- accept that, it makes cool arrangements. In the ground its kind of a monster. It lives to multiply and in soil that too rich you will end up with 100,000 in a short time. Don’t torture it just don’t pamper it. Great plant for the rough life of the back 40 or a forgotten corner of your yard. Don’t recommend putting it in a hellstrip as it would spread so fast you would soon find Gladzilla monoculture. Completely winter deciduous- nothing there. Emerges relatively late in spring but it goes fast. Excellent cut flower. Strong deer resistance. Water? Yeah.. if you want. 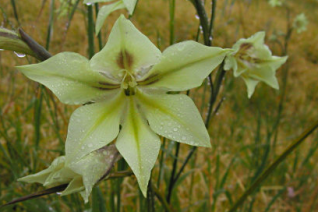 Unusual species gladiolus that is actually an early spring bloomer and at night possesses a wild sweet powerful perfume. Very thin grassy foliage forms clumps to 10″ tall. It appears in autumn with the first rains after summer dormancy. In March flower spikes rise to twice as tall as the leaves an open wild looking simple luminous yellow flowers. They have fancy markings on the inside lower two petals. At dusk the perfume arrives and does it flow. I’ve smelled this flower from 20′ away on mild spring nights. It makes a great cut flower but this mysteriously diminishes the perfume. 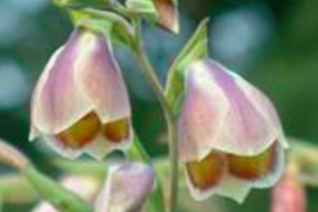 Full sun and VERY WELL DRAINED soil- such as a rock garden or a hillside. It dislikes competition so give it space. Excellent with a mulch of gravel. Don’t plant this in a crowded bed in rich wet soil it will die out or it will quickly be overwhelmed. Fun plant to grow. Needs no supplemental water cause its totally dormant by summer anyway. Precious! Amazing little spring blooming iris from the eastern U.S. Tiny green fans of leaves creep along the ground and form interconnected colonies with their long rhizomes. In late March into April 3″ wide soft blue and white flowers appear out of nowhere. The rise above the low foliage to 5″ high. PRECIOUS. The lower petals (the falls) have a zone of darker blue and orange. PRECIOUS. Part shade in rich woodland conditions- excellent under established shrubs or at the fore of borders in the forest. Regular summer water. High deer resistance. Completely disappears in the winter. PRECIOUS. Little spring wonder from the east. 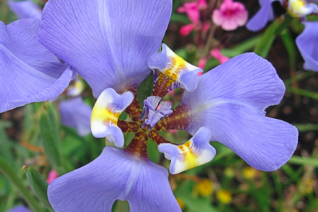 A groovy selection of our coastal native evergreen douglas iris. From spikey grassy clumps rise 2′ tall flower spikes topped with multiple blooms that are amber and maroon, intricately marked on the interior falls. Blooms April to June. 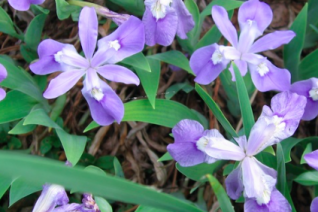 Vigorous clump forming perennial for any soil type where there is not standing water. Regular water to establish the first season then none in subsequent years. Full sun. High deer resistance. To 2′ wide in a few years. Oregon native plant.